Yate, C. E. (1900) 'Khurasan and Sistan. William Blackwood & Sons. London. The general conclusion is that the use of glazed and lustered wall tiles not only preceded the fully developed faience but that the tiles continued to be used in the same limited fashion after mosaic faience had become popular. 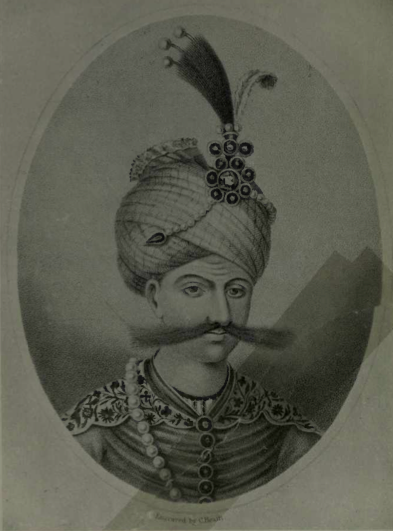 Gauhar Shad was also responsible for the addition to the shrine of the halls known as the Daru'l Huffaz and the Daru's Siyada, which adjoin the tomb chamber of the Imam. 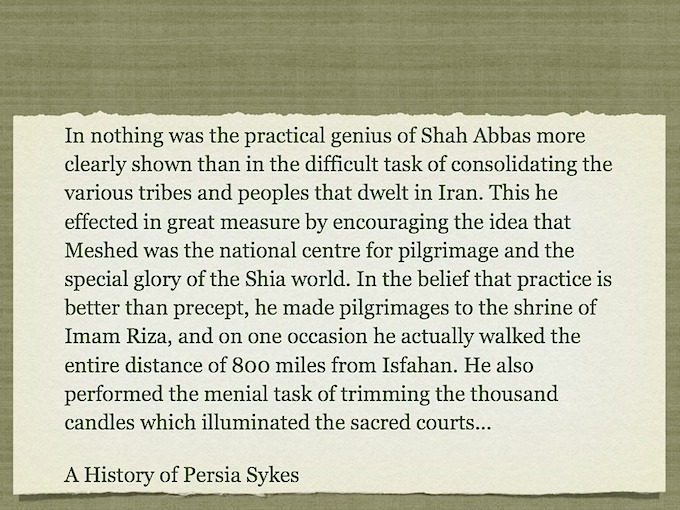 Lockhart, L. (1939) 'Famous Cities of Iran' (page 26). Walter Pearce & Co. Brentford. At last the busy hamlet of Sharifabad was reached, the approach being through fields of poppies, along streams of water, and past a fat graveyard. This station is the last halt before crossing the high ridge of Kuh-i Salam, ' the Hill of Salutation,' as the pilgrims call it, which shuts off Mashad from the impatient view of the travel-worn devotee. Broad is the path, and rocky is the way, I might add, that leads over this lofty Salamat height; and many is the pious wayfarer that sinks beneath the task of its toilsome ascent before the summit is reached and his sight rewarded by a glimpse of the golden dome of promise. *Ya Ali! Ya Husain! Ya Imam Riza!' he cries out with glad heart, for his eyes have beheld at last the blessed city, and he falls upon his knees in prayer and thanksgiving to Allah for having vouchsafed him the divine privilege. The Imam's (a.s.) tomb under the gilt dome has three railings or gratings around it. The first of steel has no inscription or date at all. Between the first and second railing is perforated copper work, covered with gilt, put up to protect the jewelled gate of the second railing. The second railing is also of steel with four emeralds at the corners fixed in plates of gold. It has an inscription in two lines in Nastalik character, stating that it was put up in 1747. The third railing is also of steel, and has the 76th chapter of the Koran engraved on it in full in Suls characters, inlaid with gold. At the foot of the tomb is a projection, behind which is the jewelled gate put up by Fateh Ali Shah. The cover of the tomb is made of wood, inlaid with gold and bears on it the name of Shah Abbas. The greater part of the original shrine and the adjoining buildings were destroyed in the tenth century A.D. but Sultan Mahmud of Ghazna, although a strict Sunni, erected a new domed building over the two graves in A.D. 1009; it is said that he erected this building because 'Ali, the Prophet's son in law and the first of the Imam's, appeared to him in a dream and urged him to take this step (Lockhart 1939:25). In the twelfth century, the shrine was still a regional pilgrimage site. In 1330, famed Muslim traveler Ibn Battuta described the tomb covered with gold and silver and called it a place of veneration. 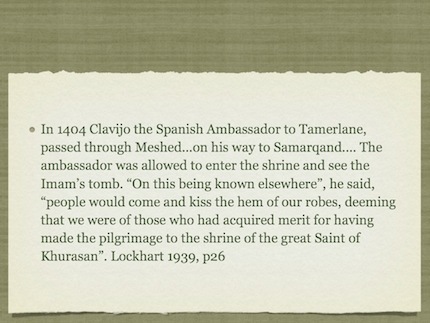 He noted that pilgrims kissed the ground next to the shrine. In the fifteenth century Tamerlane’s son Shah Rokh and Gohar Shad, Rokh’s wife, enlarged the shrine and endowed a mosque, and Mashhad became the capital of the Khorāsān region. 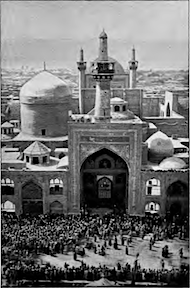 Mashhad has been the object of numerous attacks over the last four centuries (even in the early twentieth century). Although the shrine itself has escaped complete destruction, the original ninth-century tomb shrine has been rebuilt several times. In the seventeenth and eighteenth centuries, the present structure was reconstructed and sumptuously decorated. Further embellishments have been added, the most recent in the past decade. 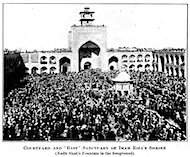 The shrine complex consists of some thirty structures representing more than five centuries of building: mosques, oratories, colleges, libraries, sanctuaries, caravanserais - all connected by four huge courts, from 175 feet to 300 feet in length, which are surrounded by double tiered arcades faced with enamel tile. A golden dome and two minarets enriched with white inscriptions on ultramarine bands are reflected in pools. A succession of courts punctuated by portals and twelve high ivans proclaim with dazzling opulence the Shi'ite veneration for the martyred Imam. From the entrance through the upper esplanade, through the old court to the farther end of the lower esplanade (ACB on the plan) is over a thousand feet. The fifteenth century mosque of Gawhar Shad, technically separate from the Shrine, is physically contiguous and furnishes an impressive climax to the courts. The court facades are not everywhere of the highest quality, but the gold ivans are dignified and sumptuous. In their towering masses of softly shining gold framed in glowing blue faience mosaic they are not surpassed for sheer opulence in Islamic architecture.. 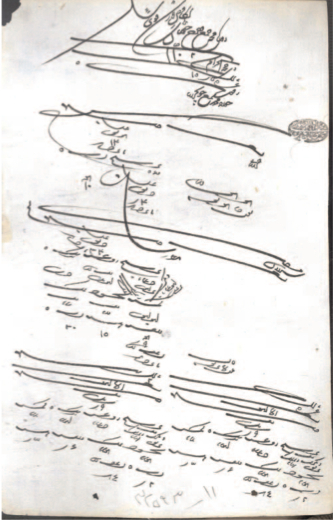 In the old court, facing the gold ivan of Ali Shir Nawai (B on the plan), if the blind ivan (F) inscribed as the gift of Shah Abbas II, 1649. Exceedingly tall and narrow, its deep blue tinted depths make a perfect foil for the golden minaret rising behind it, and its collars of intense ultramarine bearing white inscriptions enhance all (Pope 1969:97). Behind the shrine is another handsome court, that of the beautiful Mosque of Gauhar Shad, already referred to as founded by Shah Rukh's pious queen, and a small masjid which that liberal benefactress generously built to commemorate the stubborn zeal of an old woman who held out for a long time against selling the queen her land. 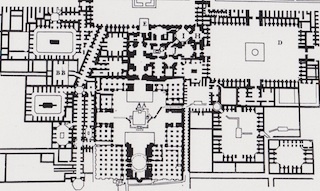 Besides these there are two caravansarais for the pilgrims, including even a public kitchen, several madrasahs for the students and priests, and yet another quadrangle, the New Court (less imposing than the Old), on the southern side of the great compound. 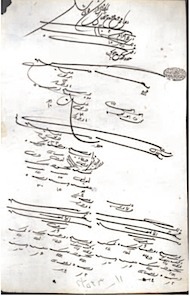 Nor must mention fail to be made of a portico that leads into the section of the Lower Khiaban which is enclosed within the precinct and near the New Court; for on its top is the Nahdra Khanah or 'Music House,' from whose balconied height the kettle-drum and trumpet sound forth the arrival and departure of the sun with as discordant a noise as the wild fanfare which hailed the king's triumphant pledge in Hamlet. Lockhart, L. (1939), Famous Cities of Iran, Walter Pearce & Co. Middlesex. Pope, A. U. 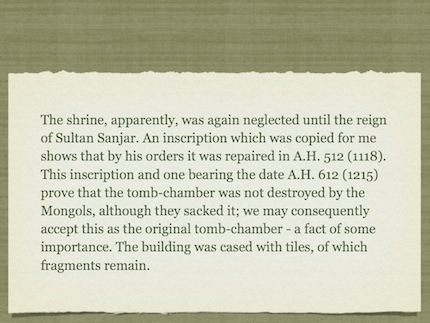 (1969) Persian Architecture, Oxford University Press.